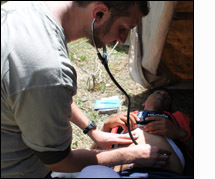 In April 2013, I had the opportunity as a third year resident to volunteer with the Himalayan Health Exchange program in the northern Indian state of Himachal Pradesh. The month-long medical excursion took a group of 30 medical students, residents, and physicians to rural villages and Buddhist Monasteries to provide acute medical care and annual wellness exams for these under treated populations. We ascended to villages in the high elevations of the Himalayas and set up mobile health camps in addition to visiting local monasteries to treat young and old monks. As a family medicine resident, I oversaw a tent either dedicated to Medicine, Pediatrics, Gynecology, or Pharmacy. Medical students would gather the medical history, and after presenting the case to me, we would review the assessment and devise a plan together. The organization has a well-stocked pharmacy that allowed us treat a wide variety of acute conditions and also start medicine for more chronic problems. By providing a medical note of our evaluation, the patient was able to ensure appropriate continuity when visiting a local physician during follow up. The Himalayan Health Exchange organization has developed an efficient system to work in a mobile health setting for the last 17 years. In addition to providing medical students and residents a powerful medical and personal experience over a month-long expedition, the organization has invested in local sustainable projects like supporting orphanages and donating funds to local primary health clinics. I am grateful to the Benjamin Josephson Fund in its generous assistance in helping to fund this unique experience, and hope others will have the opportunity to learn about medical care in a challenging international setting.